Finance minister Piyush Goyal dished out doles to large sections of the population with an eye on the forthcoming Lok Sabha elections due to be announced in a few weeks. It had a £600 million per annum direct income transfer for small and marginal farmers – those with holdings below 2 hectares or about 5 acres. The tax liability on those with incomes up to Rs 5,00,000 was cut to zero. And there was plenty more for other segments. Prominent among these was the promise of a Rs 3,000 per month pension for those working in the unorganised sector when they reach 60 in return for a monthly contribution of Rs 55 to 100 depending on their age when they join the scheme. The interest subvention scheme currently available to farmers has been extended to fisheries, poultry and dairies. That means they can get up to 5% off on their interest rate if they repay loans on time. The coastal regions and eastern India, many of which have not been BJP strongholds but are very much on the party’s radar for 2019, were clearly the focus of this measure. The relatively well-off middle class wasn’t entirely overlooked either with standard deduction on income tax being hiked from Rs 40,000 to Rs 50,000. Within the middle class, there was something for senior citizens – by raising the TDS limit on bank and post office deposits as well as rental income, the FM hoped to make their life easier by reducing paperwork. The budget also gave homeowners much to be happy about. 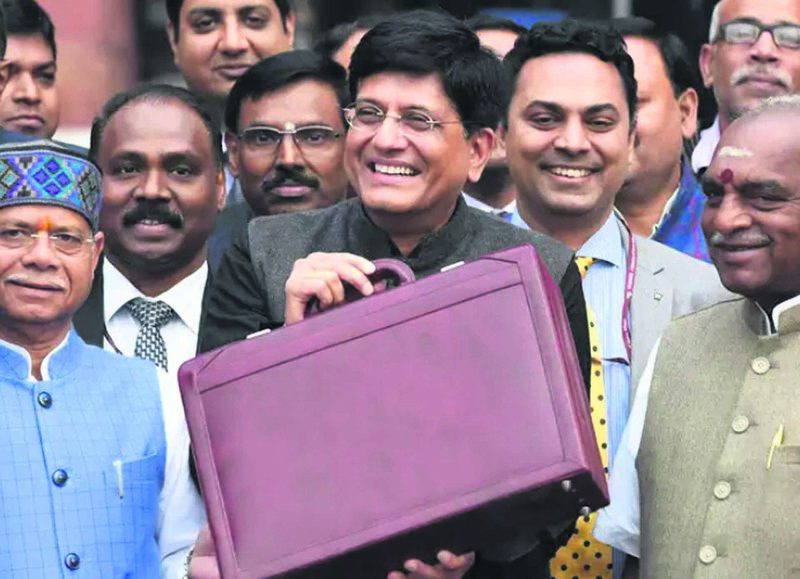 The budget speech, which lasted about an hour and 45 minutes, saw the treasury benches led by Prime Minister Narendra Modi repeatedly thumping their tables while the opposition, Rahul Gandhi in particular, wore a sullen look. It wasn’t just about goodies for specific constituencies. Much of it was a showcasing of five years of the Modi government – from low inflation rates and high growth rates to toilets, gas connections and bijli for the masses. In a departure from the past, the government decided to immediately roll out the schemes. While the pension plan will be launched on February 15, the income support for farmers is effective from December 2018. The break from the tradition of outgoing governments not making major tax changes was justified by Goyal who argued that relief for certain sections could not wait. Besides, he maintained, this was no more than a continuation of the NDA government’s policies. India’s military modernisation will continue in its usual slow and haphazard manner, with the annual defence budget registering a measly 6.8% hike over last fiscal’s revised estimates. This just about caters for inflation, leaving the over 14,00,000 strong armed forces once again without any hope for a concerted military modernisation drive on all fronts. The defence budget is pegged at £31.8 billion, which is just 1.5% of the projected GDP for 2019-2020, the lowest such figure since the 1962 war with China. While this figure has been steadily declining as the economy expands, experts contend it should be over 2% to ensure the requisite military modernisation to tackle the “collusive threat” from Pakistan and China. The ballooning defence pension bill now stands at £11.2 billion. Of the £31.8 billion figure, the capital outlay is just £10.82 billion for new weapon systems and modernisation, which continues to be dwarfed by the £ 21.06 billion revenue expenditure for day-to-day running costs, salaries and the like. A Rashtriya Kamdhenu Aayog brings the “gau mata” to the centrestage as a political-cultural emblem, in keeping with the Modi government and BJP’s courtship of conservative Hindu constituencies. The interim Budget said the Aayog will scale up genetic improvement in cattle resources, enhance productivity and look after “effective implementation of laws and welfare schemes for cows” - the last intended to tackle the problem of stray cattle and crowded shelters. The Aayog is in addition to the existing ‘Rashtriya Gokul Mission’, which aims to conserve and develop indigenous breeds to increase bovine productivity. The government announced an increase in allocation in the current fiscal from £30.1 million to £75 million through revised estimates. If all goes to plan, about 120 million farmers should receive Rs 2,000 each from the government in their bank accounts by March 31 as the first instalment of the Rs 6,000 annual ‘assured income support’ scheme announced in the Budget. The scheme is for those with cultivable land up to 2 hectares (or 5 acres). About 86% of farmers would qualify. The new Pradhan Mantri Kisan Samman Nidhi (PMKisan) will entail an annual expenditure of £7.5 billion and will be made effective retrospectively, from December 1, 2018, for which the government in its revised Budget estimate for the fiscal provided an additional £2 billion for a quick roll -out. The Centre has sought to restrict the benefits to small and marginal farmers. Aiming to build on the momentum in road-building and railway augmentation, the government has allocated around £19.3 billion for transport infrastructure for 2019-20 to push construction and expansion of highways, railways, rural roads, Metro, shipping and waterways. While the allocation for railways has gone up by 21% and capital expenditure pegged at more than £15.8 billion, for highways sector the hike is nearly 5.8%. There is a 54% cut in allocation for aviation sector from £ 970 million in 2018-19 to only £450 million for the next financial year. Spending by NHAI is estimated around £11.2 billion in 2019-20. Highlighting the acceleration in highways and railway sector, Goyal said, “India is currently the world’s fastest highway developer, with 27km of highways built each day.” The Centre has allocated £8.3 billion to the road transport and highways ministry. For railways, it has allocated nearly £6.67 billion for 2019-20 compared to £5.51 billion for the current FY. Railways has been allowed to raise £9.4 billion from the market to make an all-time high capital investment. “We see many positive elements that will support consumer spending and economic growth, including a boost in defense and health spending as well as a renewed focus on digitisation of government processes as well as artificial intelligence,” US India Business Council (USIBC) president Nisha Desai Biswal said. The creation of a single window for approvals in film production will boost the media and entertainment industries as well as measures on anti-piracy, she said. Karun Rishi, president of USA-India Chamber of Commerce said the interim Budget was pro farmers and middle class. Fiscal stimulus to small and marginal farmers and tax sops for the middle class will lead to more disposable income. “This will result in increased consumption. It will likely boost the rural economy and surge domestic growth,” Rishi said. Even with these sops, the finance minister has managed to keep the anticipated fiscal deficit at 3.4 per cent. The deficit is well within range. Finance Minister has succeeded in doing a fine balancing act, he said. “With this budget, growth is likely to improve further and meeting 7.5 per cent real GDP target,” Rishi said. Noting that the 13 per cent increase in Department of Health and Family Welfare budget is laudable, he said this confirms Indian government’s dedication to Healthy India initiatives and its commitment to serving the poor and needy. Threefold increase in allocation to Ayushman Bharat reinforces the commitment towards Universal Healthcare for all citizens, he said. For the last 13 years, USAIC has been pitching for increased outlay on Science and Technology. NDA is looking to tap conservative Hindu votes through a Rashtriya Kamadhenu Aayog for genetic improvement of cows and welfare schemes for cattle with £75 million funding. This will boost the Rashtriya Gokul Mission and likely address the problem of stray cattle. Apart from putting the bovine on a national pedestal undergirded by the Constitution’s directive principles, it transforms what was considered to be a fringe obsession into a mainstream concern.